Building a beautiful walk in shower is easier than you think. It does require a bit of time and hard work, but the payoff is a fantastic shower and should be well worth the effort. For the cabin, a bathroom remodel was high on our list of things to do. 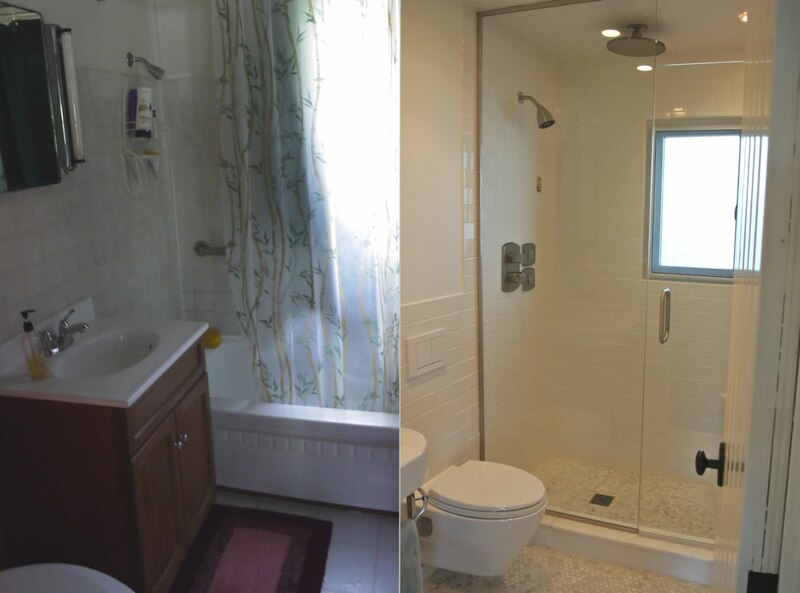 The existing bathroom was a small (5′ x 8′) full bathroom. We really wanted to open up the bathroom and make it easier to use and enjoy and since we had no additional room in the cabin to enlarge the footprint, we need to find a way to use the existing space better. We decided to get rid of the space hogging bathtub and replace it with a large walk-in shower. We also maximize the sense of space and natural light in the bath by using heavy glass to enclose the shower. The bathroom came with a bathroom window. Although the window did provide much natural light and ventilation, bathroom windows are notoriously problematic, and we would need to put some thought into it’s incorporation into the new shower. In addition to the new shower, we swapped out the boxy sink, and vanity for a simple wall mounted sink. For the toilet, we junked the old tank toilet and replaced it with a European style wall mounted unit. We also replaced all the flooring, laying new tile with electric radiant heat installed under the tile. Before and after images of bathroom and shower remodel at the cabin. In the end, the bathroom transformation took some time, but in the end was totally worth it. Our new bathroom is light, bright, open and feels functional and luxurious despite the small size. All of the bathroom remodeling projects we did to our cabin bathroom are within the grasp of anyone willing to dedicate some time and effort. 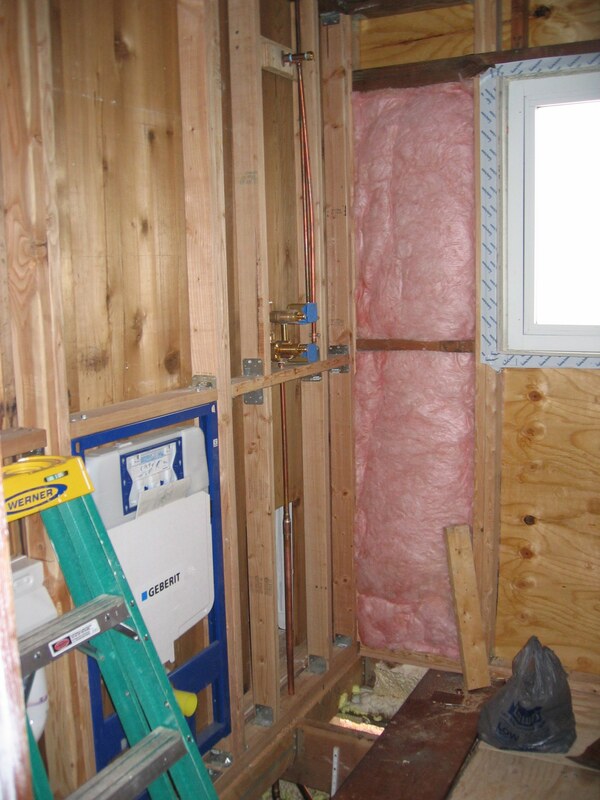 I plan to document all the bathroom projects in time, but to begin with here is a series on building the shower. Read on for an overview of how we did it. 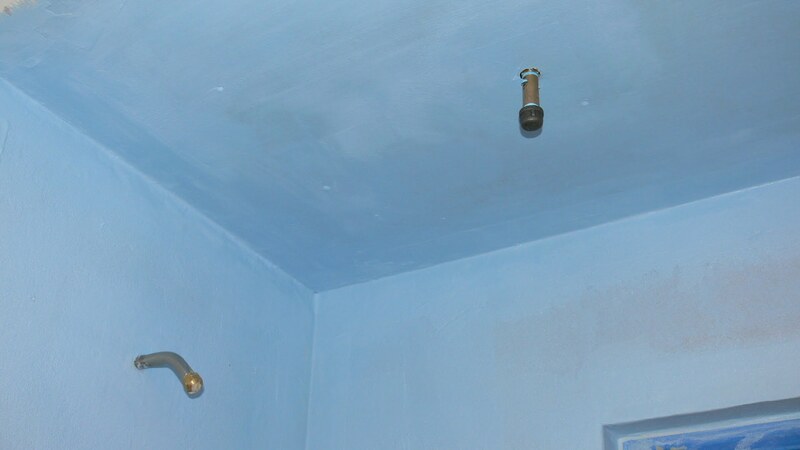 For more details, click on the individual articles in the building a shower series. Enjoy! 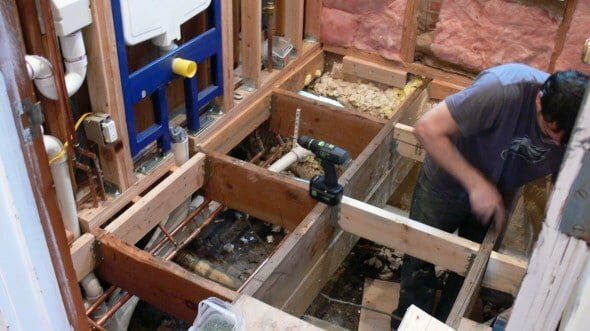 The process of building a shower can be broken down into several steps. To start, the structural framing for the shower walls and floor need to be complete and suitable for the planned shower. Next, all shower supply and drain plumbing needs to be installed and tested. 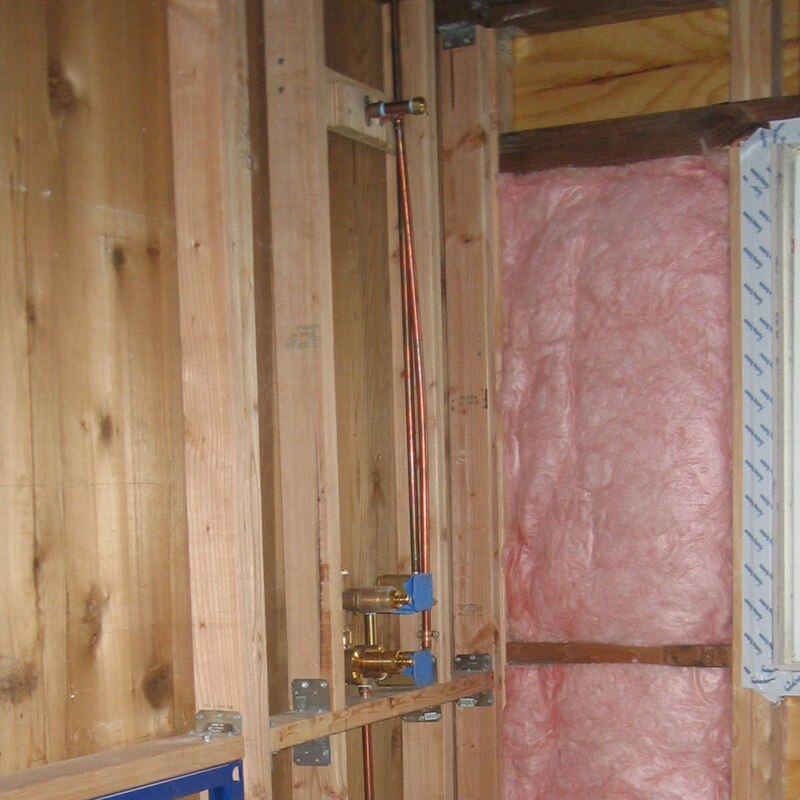 Sheathing for the shower walls is installed next and a shower base or shower pan is created. Finally, the shower surface is finished (usually with tile) and the plumbing fixtures are installed (shower head, mixing valve plates and knobs). Demo existing structure as needed. Remove old tile, sheathing, fixtures (tub) and flooring. Replace and repair framing and floor joists as needed. Bathroom floor joists reinforced with blocking prior to completing shower. 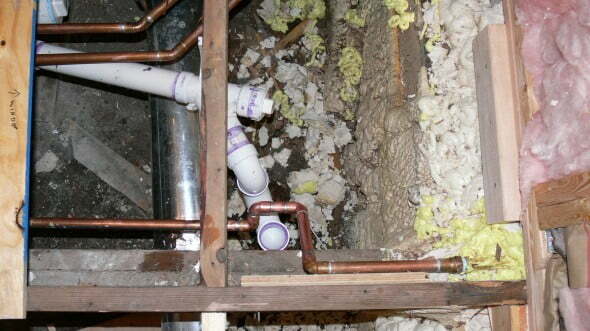 Install shower supply plumbing, mixing valves and shower drain plumbing. Shower supply plumbing installed, mixing valves connected and installed. Shower drain plumbing with clean out and P-Trap installed. Install subfloor and curb frame. 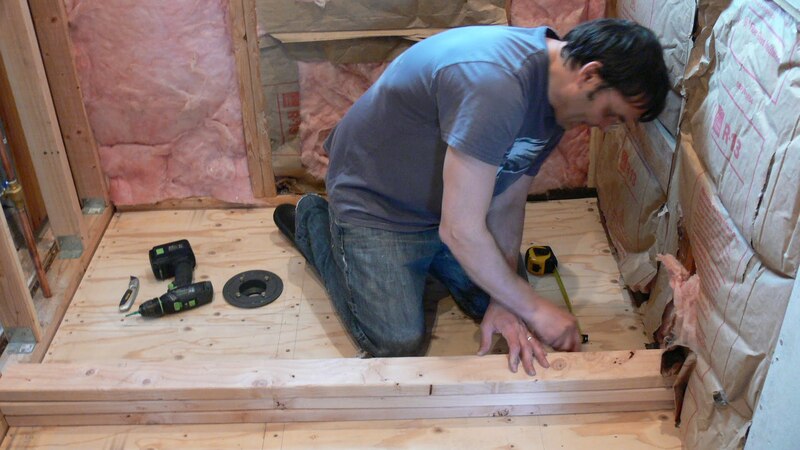 Install plywood subfloor, drain base and shower curb frame. 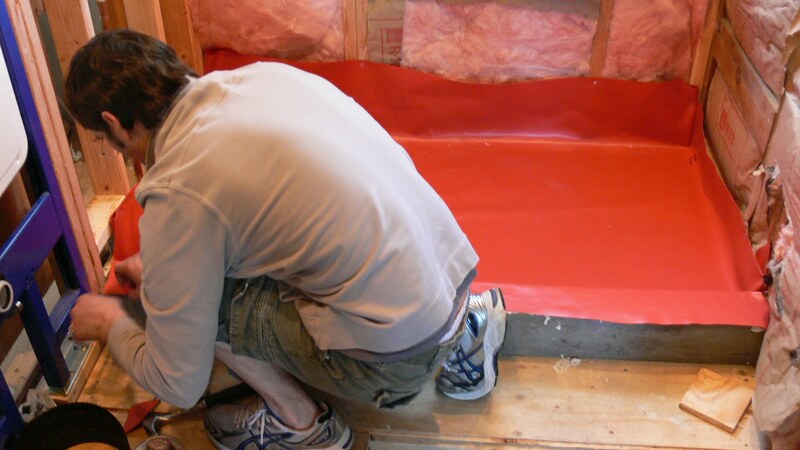 Pour shower pan and curb, install shower pan liner. Shower pan and curb poured with install of shower pan liner. Finish shower pan and install tile backer board. Completed shower pan and drain. Cement tile backer board installed and taped. Waterproof tile backer board (if needed). Waterproofed cement tile backer board using paint on Hydro Ban by Laticrete. 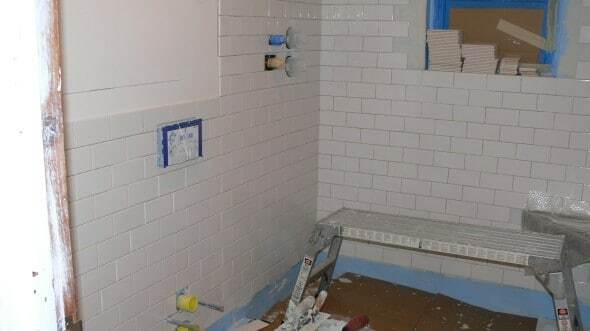 Shower walls and ceiling tiled with 3″ x 6″ white ceramic subway tiles. We used white un-sanded grout white subway shower tiles. Remove grout haze, seal tile and grout. Elena uses a soft cotton cloth to remove tile grout haze from shower tiles. 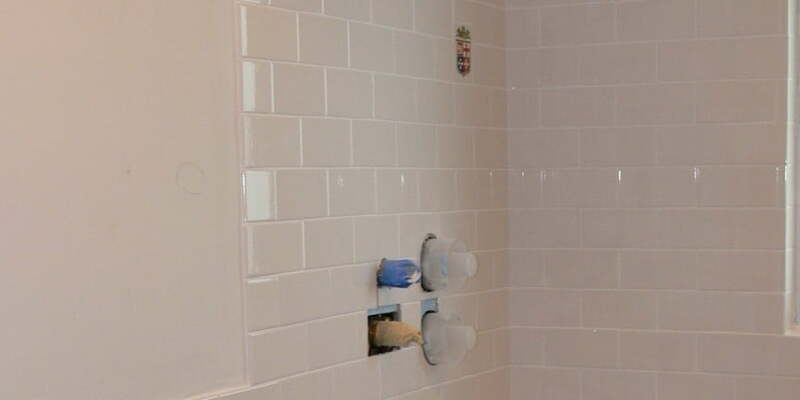 Install shower heads, and mixing valve knobs and trim. 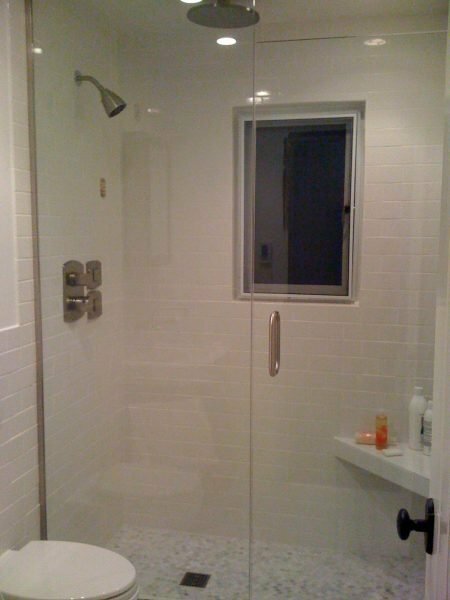 Install shower heavy glass wall and door (subcontractor). How to build a walk-in tile shower. 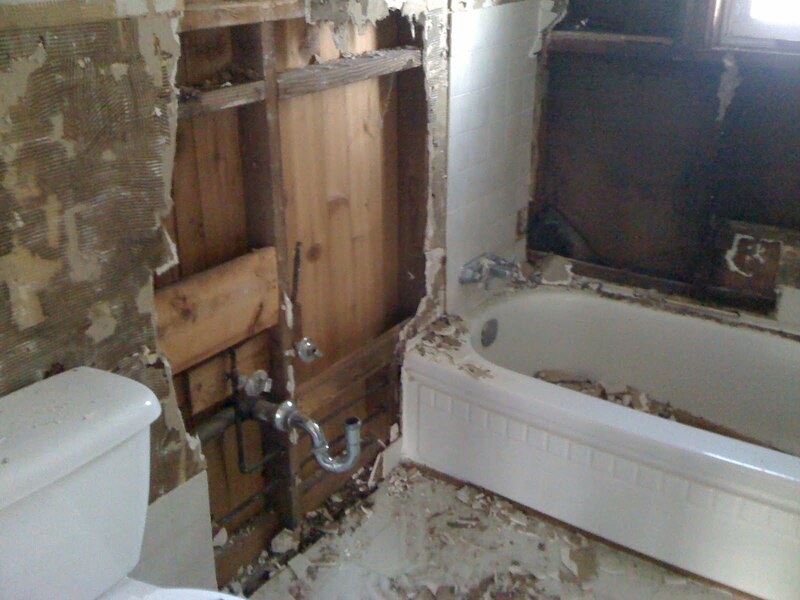 Demolition of old bathroom walls, tile and tub. Reinforcing floor joists with solid wood blocking. Wall studs replaced prior to building new shower. Completed shower pain and drain with installed and taped cement board. Install shower tile - we tiled the walls and ceiling withing the shower. I noticed you didn’t include a section on tiling the floor of the shower. Around the drain is what I was mostly interested in. Does the floor go in before the walls? It would greatly help me to see this step. Thank you. 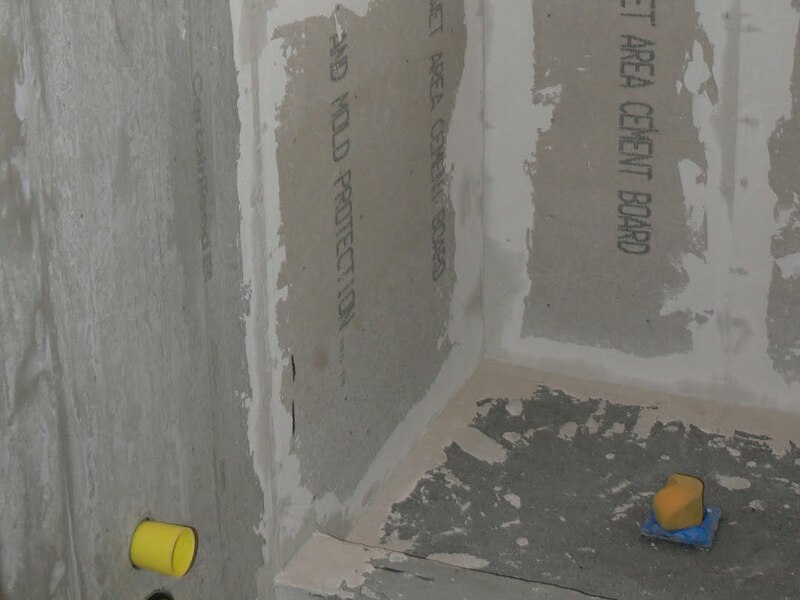 If you have a properly built shower pan with a liner that correctly travels up the shower walls some distance, you shouldn’t need to worry about which surface is tiled first. In practice it seems logical to tile the shower floor first and then overlap the wall tile for water path reasons. But, if the shower liner is properly installed, wall vs. floor tile first should not matter – it will be waterproof. 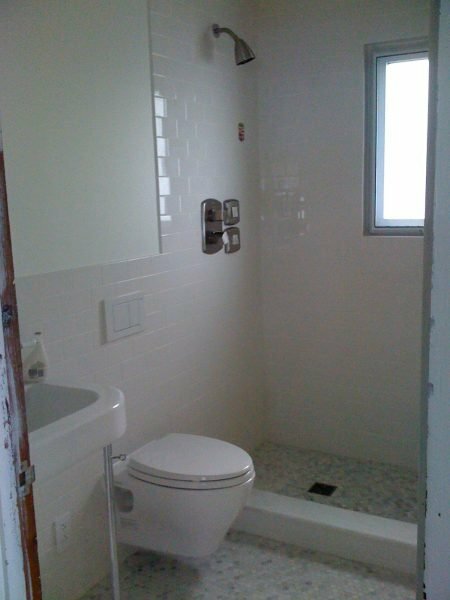 1) It is much easier to have a better finished edge at the floor and wall corner when the wall tile is installed first. With the slope of the shower pan, you would need to make very accurate angled cuts to the wall tile to match the slope of the shower pan. If you install the wall tiles first your cuts will be hidden by the overlapping floor (pan) tiles which are easier to cut clean as you will be just making a square cut. 2) It is easier to keep the tile surfaces clean if you tile the walls and ceiling first. Any thinset or grout that falls to the shower pan can be cleaned off the concrete pan fairly easily. 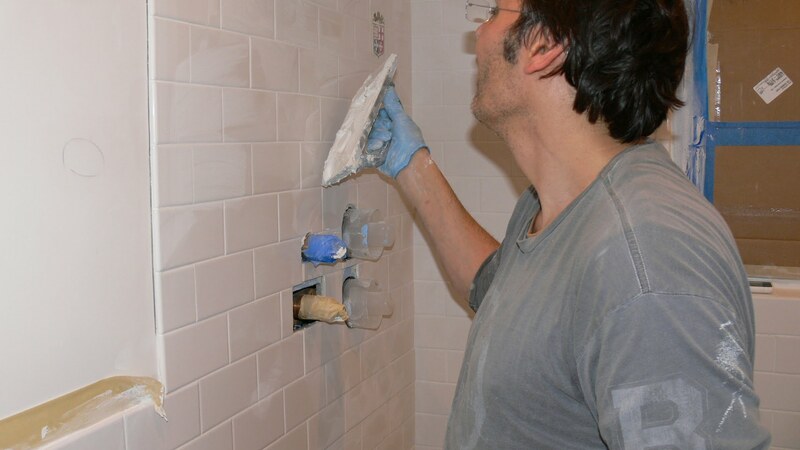 Then when the walls are finished you can tile the shower floor (shower pan) without fear of getting stray thinset or grout on them.